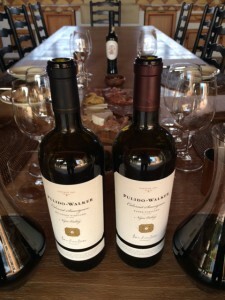 We’re so grateful for the overwhelming response Pulido~Walker wines have received since our inaugural release in 2010. With all vintages quickly selling out, there is much anticipation for the upcoming release of our 2012 single vineyard designate Cabernet Sauvignons. Valley floor or hillside—2012 was a textbook perfect winegrowing season throughout the Napa Valley. Moderate temperatures with no heat spikes made for ideal conditions for extended hang-time and optimal ripeness. In the Panek Vineyard, the fruit took its time and the clusters hung well beyond previous harvest dates. The wine was crafted primarily from Clone 6, with inherently more structure due to the small berry size and thicker skins. The 2012 vintage has plenty of backbone to balance the more fruit-generous qualities of the valley floor. The caramelized brown sugar and maple syrup elements that are indelible flavors are ever present in this wine. On Pritchard Hill, the 2012 vintage from Melanson Vineyard was nearly ideal from bud break to harvest. Ample ground moisture early in the growth cycle produced a very good set in the Melanson Vineyard. The sumptuous fruit harvested in October produced our most complete Cabernet Sauvignon from this vineyard to date. The wine is round, full, rich and accessible—all the punch and power is there with no sense that it will take time to smooth out. 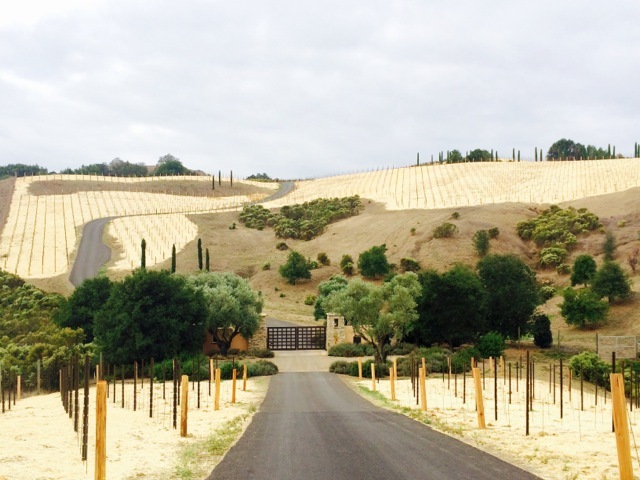 We look forward to releasing our 2012 Panek Vineyard in late January 2015 and the 2012 Melanson Vineyard in August 2015. After years of soil and climate studies, our Mount Veeder Estate Vineyard has begun to take shape. 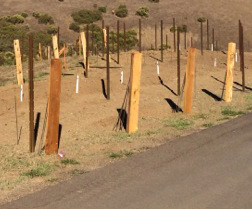 During August, vineyard marking and staking began as well as the installation of the split cedar end-posts. The trellis infrastructure was selected for its ability to hold the canopy during the growing season properly and build a light environment that will allow the full maturity of the fruit. The selection of split cedar end-posts and a strong steel trellis system not only gives a natural organic look but also is quite sustainable. The “double poly” drip irrigation system that will be used on our vineyard is the best there is. The greatest advantage of this system is that eventually from a phone or tablet we will be able manage each irrigation block separately. To winterize the vineyard, wheat straw has been laid down on the ground and barley has been planted as a winter cover crop. In the late spring/early summer, the vineyard will be spaded and tilled so that the permanent cover crop is planted with nitrogen fixing components. Our Mount Veeder Estate Vineyard will be divided into 15 blocks, with 75 per cent of the vineyard being planted to Cabernet Sauvignon and 25 per cent to Chardonnay. The clones were hand selected by our winemaker, Thomas Rivers Brown. For the Chardonnay, we are using 3 different clones: the Montrachet clone, Calera clone, and Wente clone. For the Cabernet Sauvignon, we will be using 4 different clones: France ENTAV—15, 169, 685 and Heritage 30 (See Clone from Heitz’s Martha Vineyard and Chateau Margaux origins). This recipe was inspired by the creations from a private cooking class in Paris, that Daniel Ha, our Estate Ambassador attended as well as ingredients from our bountiful Estate garden. We harvested our first crop of lavender this summer, and are preparing to pick the pomegranates now that the skins are beginning to split. Here is an easy and quick recipe for seared duck breast with a sweet and savory sauce that pairs perfectly with our Panek Vineyard Cabernet Sauvignon. The floral perfume of the lavender and coriander crusted on the duck highlights the aromatics of the Panek, while the sweet reduction of the honey, pomegranate, citrus, and brandy, compliments the fruit forwardness and richness of the wine. Please enjoy!!! 1) Place the orange juice, brandy, and honey in a medium saucepan and bring to a boil. Immediately reduce to a simmer, add vinegar, and cook for 2 minutes. 2) Meanwhile, cut pomegranates in half. Hold pomegranate halves over a large bowl and beat each one with the back of a wooden spoon to release seeds and juices. Place 2⁄3 pomegranate seeds and any accumulated juices, thyme, and chicken stock in the jar of a blender; blend for 10 seconds. Strain pomegranate mixture through a fine sieve into saucepan. 3) Return glaze to a simmer. Stir in butter. Spoon over duck and garnish with remaining pomegranate seeds. 1) In a small bowl, mix together salt, lavender, and coriander. Place duck breasts, skin up, in a large dish. Sprinkle evenly with the spice mixture. Flip breasts over and place the zest, brandy, and thyme and pepper evenly on the flesh; let marinate for 30 minutes. 2) Preheat oven to 350 degrees. Place the duck breasts, skin side down, in a large ovenproof skillet over medium heat. Cook until the fat is rendered and the skin is crisp and thin, about 15 minutes. 3) Transfer breasts to oven and cook until pink in the center, about 4 minutes. Let duck rest for 2 minutes before slicing. Divide duck evenly among 4 serving plates and spoon over pomegranate glaze.